Soothe, relieve stress, rejuvenate and more! Set of six 1/6-oz. bottles. First Aid reference card details the benefits. Help calm nerves, alleviate insomnia and more. 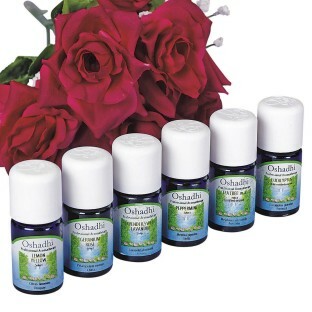 Offers an array of sweet-smelling, therapeutic essential oils to soothe, relieve stress, rejuvenate and so much more. This set of six 1/6-oz. bottles comes with a First Aid reference card detailing the benefits of each oil, like alleviating insomnia. Includes Lavender, Tea Tree, Eucalyptus Wild, Peppermint, Geranium Rose and Lemon.